The 1972 Topps Julius Erving rookie card is one of my most favorite basketball cards ever made. The design is pretty straightforward and not nearly as flashy as "Dr. J" was himself. But the colors are vibrant and the card really pops. Would the card be better if it displayed an image soaring through the air during one of his highlight dunks? But who cares--the card is still awesome! These days, his rookie card is extremely popular and has grown to be one of the most valuable basketball cards in the hobby. Distinction: This is his only recognized mainstream rookie card. There are a couple of other cards on which Dr. J appears in the 1972 Topps set, an All-Star card and an ABA Rebould Leaders card, but this one is definitely the true Dr. J rookie card everyone is after. There are many other Hall of Famers in the 1972 Topps set like Wilt Chamberlain, Kareem Abdul Jabbar, Jerry West but Erving's rookie is definitely the key to the set. Number: This is card #195 in a set of 264 cards. Design: As I mentioned in the opening, the vertical design of the card is fairly straightforward. You see a nice image of Dr. J in the middle of a jumpshot atop a bright yellow background. That visual really makes the card pop. I also love the team name whose letters increase in size as you move from left to right across the card--almost mimicking a soaring Dr. J himself going up for a high-flying jam. His name and position along the bottom border round out a great-looking card overall. Reverse Side: The back of Erving's rookie is printed with a vertical layout as well and contains his personal information and statistics from the previous season. There is also a nice write-up on the successes he enjoyed during the 1971 playoffs which resulted in setting multiple records. Near the bottom there is a cartoon of a player wearing huge sneakers; as pointed out directly next to the cartoon, Dr. J wore size 15 sneakers. In top condition, they typically sell for between $3000 and $3500. A couple years back you could find them selling between $4,000 and $5,000 in mint condition so the price has come down somewhat. Dr. J was one of the greatest and most exciting basketball players to ever play the game. Connie Hawkins, Elgin Baylor and others may have been dunking before Erving made it popular, but Known for the artistry and finesse which he brought to dunking. Moreover, his flashy style of play helped to modernize the game in general and helped pave the way for other high flyers such as Michael Jordan, Dominique Wilkins and many others today. He was inducted into the NFL Hall of Fame in 1993. 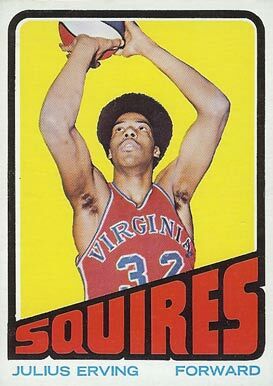 Julius Erving rookie cards will continue to remain high on the list of many basketball card collectors' want lists for quite some time.